Corson suggested that I have mutton broth for breakfast today, but cooking the barley the night before used it all. So I ate a bowl of leftover barley with a cup of milk. It was still good, although not necessarily want I want for breakfast. Like every other meat this week, it’s boiled according to the directions for Salt Pot-au-Feu. I had a chuck steak ($1.40) that I tenderized with a few whacks from a heavy rolling pin. I dredged it in salt, pepper, and flour then browned it in butter and cooking oil (.15 cents). I chopped up two potatoes (.34 cents) and tossed them in the pot, then covered everything with water and boiled it for 15 minutes. It was fine. 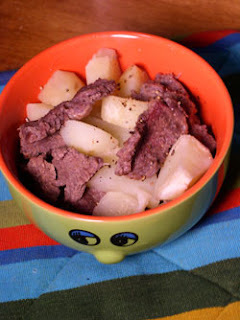 I ate all the potatoes, because it’s really hard to mess up a potato, and three-quarters of the meat. The meat was very tough. I chewed thoroughly, and tried not to choke, because I didn’t want to be found dead in my apartment next to a mysterious looking bowl of beige food. But when it was all done, I felt full for the first time this week. Either potatoes are awesome, or my stomach has shrunk. Probably both. Stupid beans. I hate beans. They take so freaking long to make. I soaked 1 cup of beans (.84 cents) for six hours, then boiled them in beef broth for 90 minutes. I sucked on a lemon in the meantime ( .12 cents). And then I smelled something burning. And it was my beans. I had been afraid of this all week: skrewing something up and then having to eat it anyway. And now it was happening. So I ate about a cup of burnt, awful beans. I am in a foul mood. And I’ve lost three pounds so far this week. I get to have hot cocoa tomorrow morning, and I am looking forward to it so, so much. Try using the “quick soak” method for beans. Bring about a quart and a half of water to boiling in a three quart pot, add 1/4 tsp baking soda, and stir in a pound of washed, sorted beans. Turn off the heat, cover and let sit 1/2 hour. Drain, rinse, and re-cover with fresh water. Simmer gently over very low heat. Depending on the age of the beans they should be done in 1/2 to one hour. Salt after cooking; adding it before makes the cooking time longer. Your beans probably took so long to cook because the broth was salted. 1/4 pound dry beans, cooked, with some veggies and starch, is a meal for two people.